Estee Lauder Re-Nutriv Ultimate Lift Regenerating Youth Eye Crème, 0.5 oz. 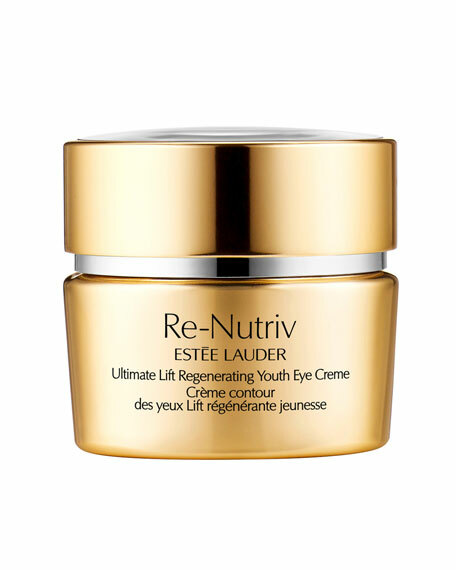 Estee LauderRe-Nutriv Ultimate Lift Regenerating Youth Eye Crème, 0.5 oz. See the skin around your eyes thrive with this soft, refreshing eye crème, infused with powerful Ultimate Lift technologies and rich, rejuvenating nourishment for the delicate eye area. Skin looks remarkably more lifted, and is strengthened to help resist future signs of aging. Crow's feet and puffiness look minimized. Dark circles are visibly brightened.